Inside the Octagon: 1:1 Pilates with Polly! As an Octagon team member I was lucky enough to recently experience a 1:1 mat and reformer Pilates session with new Octagon Pilates and posture expert Polly Benge. I went in with a number of 'normal' bodily niggles, stiff shoulders and slightly stooped posture (from a mainly sedentary job) and more specific issues such as left-sided bias (I seem to be sitting oddly and so stabilising on this side and had consequently built up more muscle on the left side of my body!). Polly began by assessing my neutral posture as I did simple roll downs to the floor, one vertebrae at a time, and back up again. Once she'd gotten an idea of my movement patterns, imbalances and bodily strengths and weaknesses we moved to the mat for a series of postures. Many of these floor postures involved micro-movements that may seem to a spectator to be doing little, yet which I could feel engaging muscles I rarely used, or was even aware of. Pilates may over time improve your superficial body but it is about so much more than this which seemed evident as I laid on the mat legs bent trying to move my leg outwards whilst keeping my hips and back stable to the floor. This sequence involved knee folds, toe taps and hip rolls. 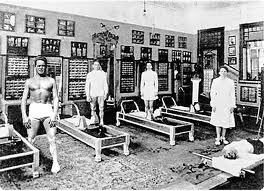 Joe Pilates, creator of Pilates original name for his new form of exercise in the 1920's was Controlology and it is clear why. However despite the trickiness and (internal) strength involved in mastering many of the Pilates moves we went through Polly made me feel calm and encouraged throughout. From the floor we moved to the reformer (more info on the differences between mat and reformer Pilates below). Using the apparatus for resistance we focused on leg exercises, which worked to strengthen and lengthen my lower body whilst stablilising my upper. I had a tendency to put my back into leg exercises as it is naturally stronger whilst letting my all important core and glute muscles do nothing (or at least very little!). Polly kindly corrected this imbalance and woke-up my lazier but much needed muscles with gentle instruction including metaphors that helped me imagine how to better utilise these neglected muscles. Polly gave me the tool to carry out a ‘pelvis inventory’ by using the visualisation of a clock face and getting me to imagine rolling a marble around every number on the dial. This simple technique freed up my pelvis, lower back and hips so that I could naturally relax into the correct neutral alignment to keep my back stable whilst I strengthened my legs, hips and arms with the proper amount of core control. (One of the things I always enjoy about Pilates, as an English Literature tutor, is it's lovely use of imagery!) Pilates is also hands on and it's amazing how a gentle tap reminds you to correct a strained or off balance posture. Polly simply had to tap my stomach to remind me to use my inner abdominal muscles when needed, or to touch my thigh to remind me to use this muscle rather than engaging my hips for a hamstring exercise! We ended our session with a bodily revaluation back on the mat, me stood up rolling my spine back up and down. After this hours worth of rehabliative movement my body felt wonderful, stretched, lengthened and, (though no doubt in my head after just one session! ), stronger. An added benefit is that my mind felt clearer too, with all the focus in popular press about Pilates being great for 'the core', I feel that sometimes the mental benefits of the exercise system getss over-looked. Pilates is a subtle, delightfully complex set of movements that means you can't be worrying about the rest of your day or your 'to do' list whilst you exercise which you can with other forms of exercise. There's a inherent mindfulness to Pilates and its an aspect that a quality teacher such as Polly really brings out with her nurturing and intuitive approach to teaching. More on Polly here and booking in with her here. Polly is in clinic at the Octagon every Wednesday morning. Call reception on: 020 8563 2608 for more info and to book in.